We are traveling light to see the snow monkeys in Nagano prefecture, Japan. We have left our heavy bags at the apartment we’ve rented in Sapporo, and taken only a tiny day pack each. In my airy, light backpack I carry a book, my iPad, a camera, a phone, a charger, our passports and wallets. For toiletries, I have a hair conditioner, a disposable hairbrush, a natural stone deodorant, a disposable toothbrush and a small bottle of Jojoba oil. I plan to use the Jojoba oil as a multipurpose leave-in hair oil, face cream, hand cream and lip balm. We each have a change of clothes and one pair of good walking shoes. We will be staying in Onsen hot spring hotels where they provide guests with shampoo and personal scrubbing towels to use in the baths, and yukatas (casual kimonos) to wear as well as sandals or slippers. We are making a small pilgrimage to the Japanese Alps to see the snow monkeys in their forested natural habitat in Nagano. After an overnight stay in Nagano city, we took the local “Monkey train” to Yudanaka Onsen. Our Onsen hotel is old and the common areas are not very attractive, but our room is spacious and is lined with attractive traditional tatami rice mats. The hotel also has a large Onsen, full of local men and women who come to bathe in the mineral hot spring-fed pools, which are large and very soothing. Yudanaka Onsen village is a rural mountain village. There are only a handful of places to eat and a small number of guesthouses. The nearby Shibu Onsen village is more picturesque, and is located just a short walk down the road. Shibu Onsen is lined with lovely old guest houses and a few shops selling local sweets, including the local Nagano speciality of buns filled with a variety of vegetables steamed in wooden baskets over an outdoor fire. In Autumn, they serve this steamed bun filled with Kabucha pumpkin or chestnuts, which are abundant during this season. Both villages lay along the Yokoyu river, where there are numerous old temples and Shinto shrines, and the surrounding mountains are covered by a very old forest of tall Beech, cedar and pine trees. Rivers and creeks of hot waters run everywhere through the villages. There are small public hot springs located in almost every other block in all the villages. They are modest tiny public bathhouses with only a small bath and clothes storage rack in each of them, for men or for women. Some hotels, like the one we are staying at, have more elaborate hot spring pools. As we walked the streets of Shibu Onsen, many guests strolled around wearing their light kimonos, waddling along the stone streets in the traditional “Geta,” wooden slatted sandals. There are not many restaurants in Shibu Onsen either. Most visitors eat at their Ryokans, or small hotels, or at their guesthouses. The price of the Ryokan often includes breakfast and dinner, and often those meals are feasts of traditional local ingredients. In the mountains, they use more mountain vegetables, including mountain potato and forest ferns, as well as forest mushrooms. We chose not to take the bus nor the free shuttle from our hotel to the Snow Monkey Park. Instead, we decided to walk from Yudanaka through Shibu Onsen and up through the forest into the Monkey Park. It is a walk of about two hours each way, but we did stop often along the way to visit the temples and shrines. Along the way we said a prayer for world peace at the Goddess of Mercy statue, towering over the surrounding valley, and paid our bemused respects to the God of tobacco, said to help those who smoke to stay healthy or to stop smoking. There are two routes into Kanbayashi Onsen, which is at the entrance to the monkey park. 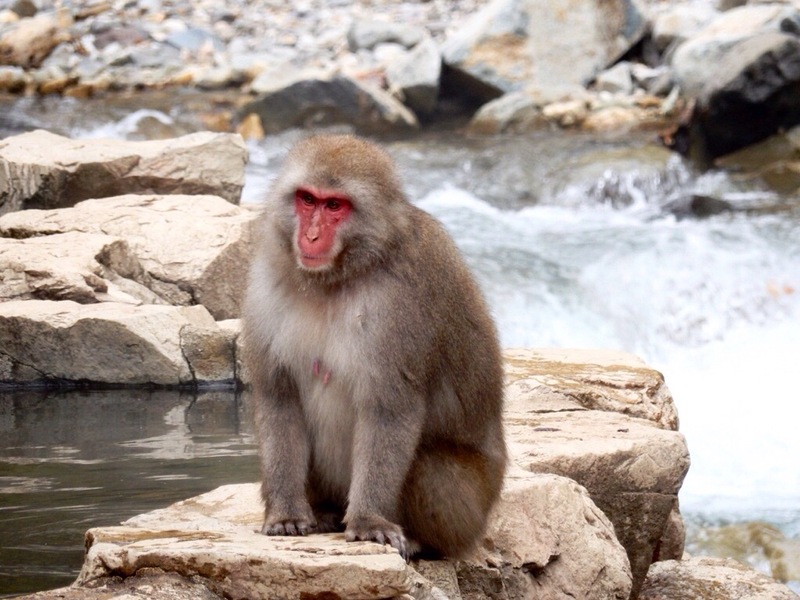 The snow monkeys in this area are the very first wild monkeys in the world who are known to bathe in hot springs. They do so to escape the harsh, cold winter. The monkeys are wild, and in the summer and on warm days even in autumn, they do not come out of the forest to bathe in the hot springs. Apparently, not all monkeys even like to bathe in the hot springs, whatever the weather, but some do love and relish it. It wasn’t yet cold when we were there in late October. Snow had not yet fallen, but we were lucky on our first visit to see the whole local tribe of more than 150 monkeys play by the river, jump and run down sheer cliffs of rocks and play in the surrounding forest. But a few young ones were also bathing in the hot springs. The monkeys are unafraid of humans and walked right by us on the bridge. It was very interesting to observe the monkeys and how they groom one another. They form a highly hierarchical society. Many of the monkeys carried scars on their faces from previous fights, perhaps in an attempt to protect or advance their position within the tribe. The babies were the cutest with their pointy ears and mischievous ways. The snow monkeys give birth in Springtime when the snow is thawing and there is an abundance of leaves and berries for them to eat. Born in April and May of each year, the babies are now a few months old and they are agile and strong and able to fend for themselves. They still love to be groomed, and make a good attempt to contribute by grooming others. I saw a line of up to six monkeys of all ages, grooming each other’s fur by parting the hair or spreading it aside, and with their thin fingers they pluck and eat the tics and lice that cling to their fur. The next time we came to the park, two days later, there were no monkeys around at all and surveying the people waiting , I asked the park ranger if she could estimate when the monkeys would be back, so we could possibly go to lunch and come back later, but she admitted to me with sheepish eyes that the word is that the monkeys will not come at all today. We felt sad for all the people who came from far away places but planned to stay for only one single night in the region, as they did not get to see the snow monkeys. We had more days to enjoy the area, and we spent a lovely day in the nearby city of Obuse. It was only a few stops away on the local train. We were pleasantly surprised to see how lovely it was, with many shops selling artistic sweets and chestnut ice cream. We walked the old streets, admiring the lovely old Japanese architecture that has withstood so well the test of time and still looks so modern, contemporary and wholesome, hundreds of years after they were built. The old house design, with its open spaces, wrap around patios overlooking a manicured Japanese garden, is so harmonious for living, for bringing in the seasons and nature through the sliding doors and having open living spaces where the energy flows freely from space to space. We had a great lunch in a soba restaurant and marveled at the original art of Hokusai at the museum dedicated to his work. We visited three museums in Obuse and an ultra modern museum near the monkey park, that had a fabulous exhibition of handmade crystal Angels, and Japanese cut paper paintings. The Japanese art of making images with positive or negative spaces by cutting paper is called Kirie, and the artist on exhibit, who is in her late seventies, has created amazing art. I was thinking about her fabulous art and about Hokusai, who only became known in his seventies, and how unfortunately I live in opposite cultures, who seem to only be interested in what young artists had to express. Some western galleries ask ONLY recent university graduates to submit their artwork, believing it to be new and more interesting. At night, as I soaked in the dimly lit hot springs, I closed my eyes, and thought about the tears that dropped from my eyes when I stood in front of Hokusai’s art. Years ago I gave up painting what people liked to collect, and swore to myself to paint what makes my own heart sing…. Even if nobody collects it…. Lying naked in the hot spring water (bathing suits are not allowed in any Japanese onsen), I felt emotional, tender and vulnerable. When I closed my eyes, I saw monkeys. In my inner eyes I saw them play, bathe, clean and groom each other. Around me, mothers were grooming their children, shampooing their daughters’ long and beautiful hair, and combing their little boys’ hair. I saw grandmothers and grandchildren, daughters scrubbing their mothers’ old fragile backs, old friends scrubbing each others’ backs, removing blackheads from each others’ backs, chatting and laughing. A distant memory of my own mother washing me and my sister in the bath and shower, came to my mind. Oh, how I loved those days…. How I loved and trusted my mother and my sister! Through the years, we drifted apart. We often did not get along, finally allowing our differences to put much distance between us. I guess it was our way of giving each other space to be whom each of us wanted to be, and claiming our own space and our own peace of mind. I guest we needed to grow and to design our own lives in the ways we wanted them to be, without the need to acquire each other’s “permission” or approval. In the darkness of the onsen, in an empty pool where nobody could see me, I let my tears flow. I cried for the love and bond that we used to have….for the unborn children that I will never have… The children that I chose not to have in this lifetime…. The tears flowed easily and were very cleansing. When my tears dried up, I realized that after all, we are all making better attempts at contact nowadays. I guess somewhere inside, we all remember how good it felt to be in love with one another, to sit together by the heater, roasting orange peels, to take baths and showers together, to scrub one another’s backs just like the snow monkeys do…. When I spoke with Jules about it, he said that he too remembers taking baths with his brother, his mother rubbing and cleaning them both. ← The end of school, Zenkoji Temple in Nagano and a trip to see the snow monkeys.